It was September 1992. Millions of snot faced skate - surfers worldwide were cracking a few brews in their bedrooms, on beaches and in their garages listening to one album... America’s Least Wanted by Ugly Kid Joe. America’s Least Wanted was a double platinum phenomenon selling over two million albums catapulting Ugly Kid Joe to headlining arenas and touring with the likes of Van Halen, Bon Jovi and Ozzy Osbourne. 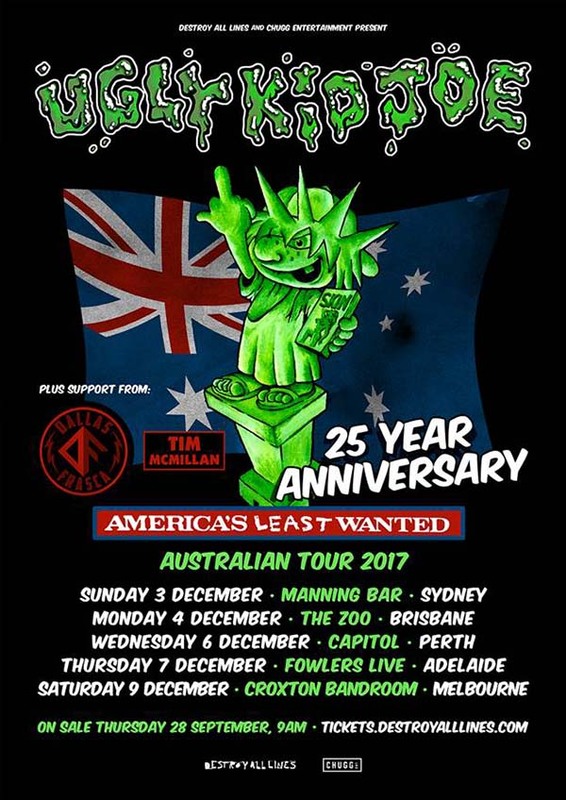 For the first time ever Ugly Kid Joe will be celebrating the 25 year anniversary and performing America’s Least Wanted in its entirety and Australia will be the first in the world to hear it as they kick off a national tour this December. It’s time to re live the simpler times and embrace this wonderfully cathartic wrecking ball of rock ‘n’ roll energy and if there’s one band that can start a party that everyone will remember, it’s got to be Ugly Kid Joe. Also along for the ride, Tim McMillan combines the melodicism of Jeff Buckley with the eclecticism of Frank Zappa and the harmonic creativity of Devin Townsend. His latest release Hiraeth is a collection of instrumental pieces and songs composed & recorded during a year on the road in Europe and feature a variety of guest musicians from the rock world, including members of Motörhead, The Sisters of Mercy, Ugly Kid Joe and Mr Bungle. Tickets on sale 9am Thu 28th September.